Richard Swift shows that our love for gold is pointless and dangerous. Gold is strange. It has almost no practical use, but it has become a standard of value that people kill and die for. Our language is full of it, as something we should all want eg. ‘good as gold’, ‘going for gold’ (like at the Olympics), getting the ‘gold standard’ or sometimes just saying ‘gold!’ to say something is excellent. Anything you can make money with is compared to gold eg.water is ‘liquid gold’ and oil is ‘black gold’. At a simple level, we all can happily walk under the golden arches of McDonald’s to get our burger and fries. We still have most of the gold that’s ever been found or mined. But we would do anything to get more. People are not sure exactly how much gold we have, but one estimate is 171,300 tonnes of gold (and some people believe we have 16 times that). It doesn’t take up much space because it is so dense. If you put it all in a giant cube it would measure just 20 metres on each side (or a 50-metre high cube at the higher estimate). We are now mining and storing more gold (2,500 tonnes a year) than ever before, mostly for ‘investment’ in gold bullion, coins and jewellery which we don’t wear very often. We take a lot of trouble to dig it out of the ground from a mine, usually in a far corner of the world, then put it back under the ground in safe storage. What’s the point? Some storage vaults have more gold than others, of course. The Federal Reserve vault in Manhattan could have 20 - 25 per cent of all the gold ever found. Many countries and private investors keep some of their gold here. So, if the Bundesbank wants to buy gold from the Bank of England, the gold never needs to leave the Federal Reserve vault. A little team of security guards takes it from the British pile to the German pile. Again, what’s the point? The worship of gold comes from long ago in our culture and history. It is usually associated with power. In the Bible (Exodus), God gives complicated instructions for how people should use gold to decorate churches. But Moses was not happy when he came down from the mountain with the 10 commandments and found the Israelites worshipping a golden calf. He immediately burned the calf in a fire, made it into powder, mixed it in water, and forced the Israelites to drink it. What Moses did relates to another feeling about gold in Western and maybe other cultures – a non-belief in gold, almost an anti-gold feeling. People see the story about worshipping the golden calf as negative worship of money. The Persians even made it a way to kill people – they forced their Roman emperor, Valerian, who loved gold, to swallow it. There are great Hollywood films like Lust for Gold and The Treasure of the Sierra Madre. Humphrey Bogart (as Fred C Dobbs) is madly looking for gold in the second film. It was based on the book by writer B Traven, who had seen how the love of gold of white people was related to the poverty of Mexico’s indigenous population. And Lenin, the Russian Bolshevik leader, said that they should use gold to decorate public toilets in revolutionary Russia. The economist John Maynard Keynes thought that gold had no place in the modern world and should be separated from currency value and public finance. And it is almost like that now, as Nixon separated the US dollar from gold in 1971. But there are still so many problems from gold today. There are protests all over the world from local communities and environmentalists against the greedy mining companies. Mines use a lot of toxic chemicals, they destroy land with huge open mines, they poison the water we need, and there is corruption and violence too. In 600 BC, the Lydians (in what is now western Turkey) first used gold as money, not just as decoration. This created a huge demand for gold. Politicians quickly put pictures of themselves on the money – and they still do this today. Gold is exciting because it has a history of pirates and kings. They killed everyone who stopped them getting the gold. This romance is similar today, with the extreme capitalism of high-risk mining companies. It’s a world of trickery, bribery, and taking over companies and resources. Small mining companies (“juniors”) often find gold, but they don’t have enough money to get it all. They then say they’ve found more than they have, so the big companies (“majors”) get interested, and they make more money. Now, gold costs more than $1,000 an ounce, so it earns a lot of money. When gold was linked to currency, people thought it could stop high inflation (at about $35 an ounce). Many central bankers and conservative economists believed this. So they ruined the economy to keep their gold. In the depression of the 1930s, governments cut social support and did not improve the economy to ‘protect’ their gold-supported currencies. And it is strange that, when the connection between gold and currency was cut by the Nixon’s government, there was no high inflation, but the price of gold increased instead. It is a big problem that gold is now so expensive. Remote mining sites are now ‘economical’, so local communities across the world are now in danger, from the Andes of Latin America to central Africa. Companies are opening old mines that were closed. Canada, New Zealand, Spain, California, Egypt – everywhere – mines are being opened again. 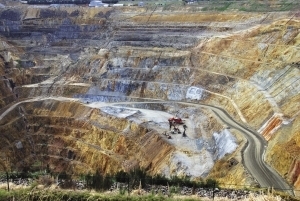 In Romania, the Rosia Montana mine in the west could become Europe’s biggest goldmine. There have been gold mines there since Roman times but mining stopped decades ago. Now the Canadians, mad for gold, now led by Gabriel Resources, want a giant mine with four pits. 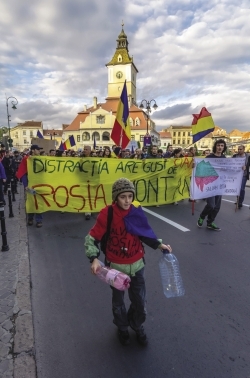 Romanians are protesting to protect their beautiful Transylvanian countryside and traditional village life. They have not forgotten the huge cyanide spill (in 2000) from the Baia Mare Australian/Romanian mining disaster that poisoned Romanian rivers. Gabriel Resources promise that this environmental disaster, which many people say is the worst in Europe since Chernobyl, could never happen at Rosia Montana. Because it is so expensive, gold is now linked to crime eg. 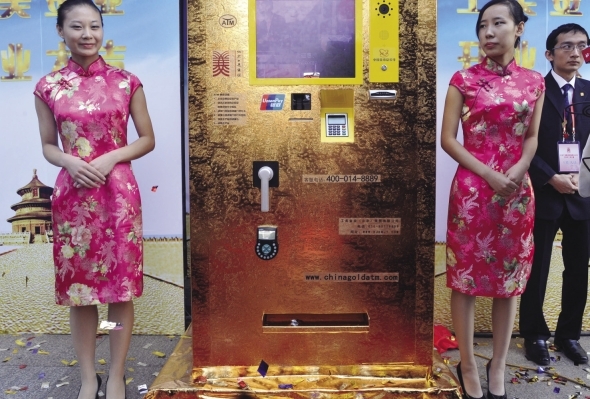 to bribery (Turkey and Colombia), price-fixing (Barclay’s Bank in London), fraud (Canada’s Bre-X in Indonesia), tax evasion (Australia and the Philippines), counterfeiting (sophisticated fake or adulterated ‘gold’ sold in the Hong Kong trade) or smuggling (India). And it is not just nonviolent crime. It can be very violent to force a goldmine on a local community who do not want it. And fighting local miners who feel they have the same right to the gold as a large mining company from another country. Sometimes the local police help the mining industry. Official police have been used recently to attack people protesting against the goldmine at Skouries in northern Greece. And to attack peaceful protesters at the El Tambor mine in Guatemala. There is a long list of attacks like this. Of course, it isn’t technically crime because it is the police who are doing it. But often, the mining company pays private security guards to protect their mine too. In Papua New Guinea, Barrick Gold (a Canadian ‘major’) fought against 170 local women who said the Barrick security guards had raped them. The women had to accept an agreement from the company, and then they had no more rights to bring legal action against the company. Barrick has another big problem in their mine in North Mara near the Tanzanian border with Kenya. In the past three years 69 illegal miners have been killed by police (trying to protect the mine). People believe these police accept money from illegal miners to protect them. So they killed the miners who wouldn't or couldn’t pay. Before foreign companies came, many poor Tanzanians had done small-scale mining in the area for many years. Now they are ‘illegal’. In the deep mines of South Africa there is almost a civil war between illegal ‘ghost’ miners (grey because they stay under the ground for too long) and the big mining companies. The companies say they lose 10 per cent of their gold (worth nearly half a billion dollars) to illegal miners. We need to stop this silly gold rush. We need to use less resources and be sustainable. We cannot continue to run around the world digging up a shiny metal that has little use, without thinking about the effects of this. We do not have enough energy to do it. We do not have enough water to produce the gold and become polluted. We can’t keep throwing poisonous chemicals away into nature. We can’t continue with the cowboy capitalism of mining companies that so easily becomes crime and violence. We need a different standard of value - not gold. We need to value clean air and water and sustainable incomes, not a strange pot of gold at the end of an old, grey rainbow. NOW READ THE ORIGINAL: http://newint.org/features/2014/09/01/keynote-stop-the-gold-rush/ (This article has been simplified so the words, text structure and quotes may have been changed). This page was last edited on 26 September 2014, at 16:48. This page has been accessed 3,021 times.